The area lies on the eastern sides of the medieval parishes of Llangwyfan and Llangynhafal and also includes part of the upland commons of Llandyrnog parish. It lies towards the northern end of the commote of Dogfeilyn, in the ancient cantef of Dyffryn Clwyd and borders onto the cantref of Tegeingl which lies to the east. The area occupies a strip along the lower slopes of the Clwydian hills, just below the moorland edge, between a height of about 125-250m, forming part of the Clwydian Range AONB. The land is generally gently sloping from east to west, but is broken by a number of steep-sided streams running off the western side of the Clwydian hills. 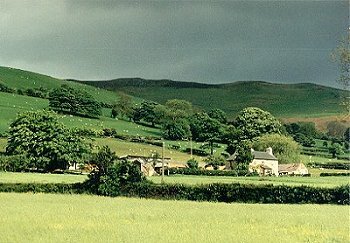 Settlement is characteristically represented by medium-sized late 18th/early 19th-century farms strung out along the spring line on the lower western slopes of the Clwydian hills, just below the moorland edge, approached by track from the public road and set amidst their own fields. Traditional building materials include local shale with the use of limestone blocks for window and door openings and quoins, as well as brick in the case of a number of 18th- to early 19th-century farmhouses with slate roofs, together with brick and stone for outbuildings, though the earlier use of timber construction is shown by a half-timbered barn at Wenallt. In several instances the farms are linked by a common name, as in the case of Rhiwbebyll-bella, Rhiwbebyll-isaf, Rhiwbebyll-ganol, Gales-bach, Gales-fawr, Gales-uchaf, and Siglen-uchaf, Siglen-isaf. Medium to small-sized rectangular fields set out along the contour. The fields are generally bounded by often thin hawthorn and blackthorn hedges repaired in places by post and wire fences, with occasional larger oaks and ash trees. Particularly on sloping ground the hedges are associated with low banks or lynchets. Occasional stone walls, some including local glacial boulders, on roadside near farm entrances. The general field pattern appears to indicate late medieval to early post-medieval encroachment of the upland commons. The area appears to include some abandoned farms. Several sheepfolds on the slopes of Moel Arthur. An disused, unspecified kiln is marked by the Ordnance Survey at Rhiwbebyll-bella farm. A well near Plas Dolben farm is a holy well, known as St Cynhafal's well, the patron saint of the church at Llangynhafal, about 0.5km to the south, referred to by a local poet, Gruffydd ap Ieuan in the first half of the 16th century.